Currently the world is experiencing the worst economic crisis since what is referred to historically as The Great Depression – a fact many a newspaper or television report will have mentioned over the last couple of years. So, how did it compare? Hopefully this article will be able to give you some idea. The beginnings at least should sound rather familiar. The seeds of this economic crash which devestated America, from 1929 -39, and which spread like a contagious disease around the globe, were nurtured in the boom years of the roaring twenties. American and Canadian agriculture boomed as the demand for food staples rose in the wake of the European war and reconstruction programmes got underway in 1918. Harvests were good to both America and europe. Marginal land on the Great Plains was brought under cultivation. Farmsteads and machinery were acquired on mortgage credit against poor quality assets and rising debt. Building projects and manufacturing flourished; both consumption and wages rose. By 1925 some $5 billion had been sunk into the new house building in the USA. As well as construction and manufacturing, the financial sector was enjoying a boom time. By 1929, the combined financial assets of American banks was just under $6 billion: about 60% in poorly secured loans, with 15% held in cash and 20% in bond securities. Bank capital held against default fell. Share prices boomed; the shares of leading firms in high-tech industries all rose exponentially, encouraging more and more share buying. Few of these companies paid dividends, so investors made huge profits from speculative buying and selling, just so long as this “bull market” kept on rising. But in the real economy of retailing and manufacturing, commodity prices fell steadily. In 1928 the Federal Bank raised interest rates from 3.5% to 5% in an effort to stop speculative buying of shares. But the 1.5% rise did not stop it, instead share prices rose, and in 1929 the Dow Jones index hit a record high of 381. By July 1930 industrial production was falling at an annual rate of over 45%. In September, the London Stock Market crashed. Within two days (October 28th and 29th) the Dow Jones lost more than a quarter of its value. Bank failures swept across America, hitting first the farming states of Illinois, Missouri and Arkansas, then Chicago, Cleveland and Philidelphia. In 1931 more trouble came from across the Atlantic: Britain came off the gold Standard, causing its exchange rates to drop and making it difficult for American exporters to sell their goods. The adoption of protectionist policies in international trade made matters worse. German andAustrian banks also failed. public confidence in the whole financial system evaporated and panic reigned as Americans began to hoard their money. By February 1933 banks in nevada, Iowa, Louisiana and Michigan closed shop. Inter-bank deposits were called in. The New York banks lost £760 million in one month alone. In March the Central Bank all stopped lending. The money supply dropped by over 30%, unemployment reached over 25%, remaining disastrously high until America entered the Second World War. 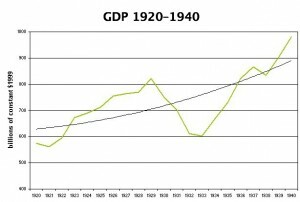 Full recovery was not complete until the 1950’s. Whilst the crisis, as our current one will also do, did eventually conclude, it does bear thinking about that we do not appear to have learnt from history.